From the author: If you’re like me, you grew up on ‘Tales from the Crypt’, ‘Night Gallery’, and ‘Twilight Zone’. I loved those anthology series and I’ve started my own collection of weird, creepy or just plain scary, stories. I’ll be posting them regularly, so sign up for my newsletter, or for the email RSS updates, and I’ll let you know when the next one is available for you to read. Patty Frayne slammed the book shut, blotting out the words that had elicited the denunciation of her favorite author. Why did I ever buy this book? I hate horror. Patty shook her head. 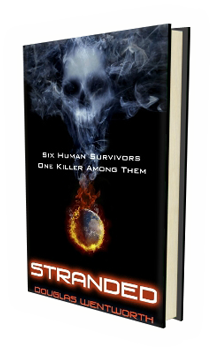 The novel she had just finished was the author’s first attempt at the horror genre (his debut novel was an award-winning thriller) and the gory images that now filled Patty’s head were seared there forever as if by branding iron. The book’s cover; that’s what made me buy it, thought Patty. She was first exposed to it in a series of tweets. The author had taken stills of famous horror movie characters and digitally inserted his book into their hands. Above the altered photos, he pasted blurbs: What Drove Norman Psycho?, What Gives Freddy Nightmares?, What Did Saw See?, etc. Patty, a junior marketing executive, appreciated the author’s implication, that his book is what sent those iconic monsters over the edge. And the more she looked at the book’s cover, the more she became intrigued by it, for the design was demonic yet inviting. 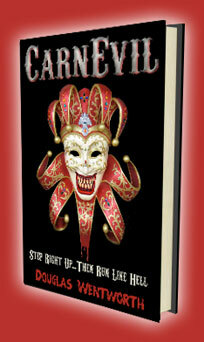 The title, CarnEvil, was set in a font that evoked carnivals of yesteryear. The letters were weathered and gray, like the sky before the storm. But it was the image below the title that caused the hairs on her head to stand just a bit straighter. A white, Venetian Mardi Gras mask was the focal point of the design. But Patty found it loathsome, for the proportions were all wrong. The artist had elongated the jaw, thus altering the mask’s neutral smile into something much more sinister; a venomous sneer exposed two rows of menacing fangs, bloodstained like the teeth of a shark after a feeding frenzy. Beneath the mask was a tagline: ‘Step Right Up…Then Run Like Hell’. Patty pictured a barker, top hat in hand, standing on a soapbox and inviting the five joyriding, Maine teenagers (she had gleaned that from the book’s description online) into his carnival of evil. Patty became obsessed with the book. She showed the tweets to Sam, pointed out what intrigued her. Should she buy it? In a way it revolted her. But then again, it called to her. What should she do? And so, a little over a week ago, Patty placed her order for the printed book (she abhorred ebooks) and this afternoon, when she returned from work and walked into her foyer, she saw the white Tyvek envelope announcing its arrival. She grabbed the parcel and turned off the foyer light, for she always followed her mother’s advice, that ‘trick or treaters’ avoided darkened doors on Halloween. After one last glance to see if any costumed celebrants had followed her up the front stairs, she twisted the rods to close the venetian blinds that bracketed the door. The house shut its eyes tightly to life on the street before it. Patty climbed the three flights of stairs to her apartment, passing the doors of the brownstone’s other four units that were now empty. It was strange how the knowledge of a unit’s inhabitants, or lack of them, altered the perception of doors. These four, inanimate, wood panels were once like living things, springing open unexpectedly and pouring out happy, smiling people. Now they were dead, empty. Patty felt that if she opened one and stepped inside, she’d be standing on the other side of a false front, like on a studio lot. But she knew better. These were high-end units, worth a fortune in today’s market, and once the building was purchased and the money was a foregone conclusion, the other tenants had packed up and left. We should’ve moved by now also, thought Patty. Every day that Sam spends working in that damn glass tower, means one more day side-by-side with that slutty receptionist. Was Sam’s promise true? Was the affair over? Patty’s hand trembled as she put the key in the slot and unlocked the door. Unlocked! Now there’s a joke. Just looking at it could open it. Sam keeps promising to fix it before the new tenants move in. Luckily, we have a few days. But, goddamn, why does Sam procrastinate? Yes, my ‘incessant nagging’ may be a turnoff, but if I don’t push to get things done, who will? Patty flicked on the lights (those that would not be seen from the street), grabbed a bottle of wine, an appropriate glass, and sat down to read her book. She was drawn into it from the very first page. At times, her knuckles were white as she gripped the sofa’s arm with fear. Every now and then she’d ask herself if she should keep reading. Yes, she thought, I have to finish it. So Patty plowed on, reading chapter after chapter, until she finished the book, drained the bottle, and had slammed the book closed. Patty unfolded herself from the couch. She stood a bit unsteadily. Though she had a problem focusing her eyes, she glanced at the windows and noticed the sliver of sky that framed the shade was now black as ink. A shiver of fear ran through her. I should’ve read this by day, or at least waited until Sam came home. And why did I drink so much? It makes me paranoid. After a quick trip to the refrigerator to grab a bottle of cola, she approached the front bay windows that faced Marlborough Street. She was in darkness and was confident that no Halloween stragglers would see her. As she tilted her head back to take a swig, she looked over the opposite row of Victorian brownstones. Rising above them, just a few hundred yards away, stood the tower where Sam was, hopefully, hard at work. “You better not be messing around”, Patty said aloud, slurring her words. Patty remembered the day, over ten years ago, when she and Sam had arrived in Boston. It seemed like every other college student had picked the same day, for they were stuck in gridlocked traffic. This gave them plenty of time to stare at the tower, over fifty stories of mirrored glass. It was taller than any building in their Maine hometown. 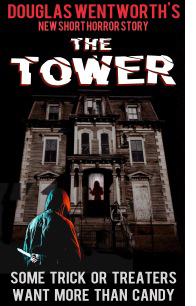 The tower became a symbol of their ‘making it’ to the big city. After graduation, Sam scored a high-paying job on its fortieth floor, and they celebrated accordingly. And that’s what Patty had set in motion. Sam was against it at first, but eventually came around after her relentless pleading and badgering. Patty turned her head from the tower in disgust, took a sip of cola, and looked toward the corner of Marlborough and Clarendon Street. She spit up and choked for air. No! It can’t be! Patty pressed her face against the glass. Yes, standing at the corner alone, looking up here! “Why are you staring at me?” screamed Patty. “Why are you here?” Patty sobbed as she stared at the costumed figure. Why won’t it go away? What does it want from me? And why is it wearing that CarnEvil mask? The masked figure, standing on the sidewalk, shifted her gaze away from Patty’s window, headed down Clarendon Street, and took the first left. This brought her to the alley that bordered the rear of Patty’s brownstone. The woman behind the mask smiled, thinking back to that day, almost a week ago, when she had been standing next to Patty at the supermarket. Patty had been examining some golden crisp apples when their elbows practically touched. She remembered looking at Patty and hearing a voice in her head, telling her over and over that the woman next to her must die. She had tilted her head toward Patty, examined her closely, and decided that Halloween would be the most appropriate night. And here it was, finally! Once she reached the back of Patty’s brownstone, the masked woman carefully opened the gate to the small back yard. Careful now! Don’t want to step on something and give warning! The masked woman slowly, methodically, examined each basement window. Wait! What’s this? Yes, one is unlocked. Now I wonder whom I have to thank for that! The masked woman pushed the window back on its hinges; they had been recently oiled and moved silently. She climbed inside, took a smartphone from her pocket, and enabled the flashlight function. Once she found the basement stairs, she doused the light, pocketed the phone, and started her climb to Patty’s unit. Patty, teary and nervous, had retreated to her bedroom. She had thrown cold water on her face, hoping to shock herself into sobriety. It hadn’t worked. That’s it. I can’t drink anymore. It’s too depressing. Of course! Alcohol is a depressant. I’m stressed over Sam, the upcoming move…and that damn book. My imagination’s run wild. I see someone in a mask, on a public street, and imagine they’re after me. It’s nine o’clock now. I’ll go to bed. Sam usually comes home around eleven. I’ll fall asleep, and next thing I know, I’ll be woken up by a good night kiss and everything will be all right. As Patty’s tense face relaxed, she climbed under the sheets. The sound of the front doorknob being rattled made her jump out of bed as if her feet had touched ice. The masked woman stepped inside Patty’s unit and looked around. Almost finished, she thought. A knife through the heart, a quick exit out the back door, and I’m home free. Granted, the doorknob made some noise as I walked in, but I don’t think I’ve been noticed. Now, to the kitchen, and the biggest knife I can find. Patty jumped out of bed, grabbed her smartphone and made for the closet. Thank God it has slats, I’ll be able to see out while dialing. Patty touched the fingerprint sensor and the phone’s screen came to life. Damn the light! It’ll illuminate the whole bedroom! Patty scrunched back as far as she could in the closet. Who to call? The police? No, Sam will call the police while running here, the tower’s not more than two minutes away on foot. The door to the bedroom burst open and the intruder leapt into the room. Patty, frozen in fear, eyes wide as saucers, peered through the slats. My God, she thought as she saw the large boning knife grasped tightly in the intruder’s hand. I’m going to die! Patty looked at the phone and willed herself to move. She was paralyzed. No! Not like this! God, please let me press the last button! The masked woman tore the closet door open. Patty screamed as the knife plunged down, slicing into her neck. She collapsed onto the floor, her right hand outstretched, still clutching the phone. The masked woman leapt onto Patty’s back and raised the knife high above her head, preparing it for the fateful plunge. Patty, on the verge of unconsciousness, moved her finger and pressed the last digit then the send button. I did it! The call will go through. Sam will be alerted. My murderer won’t get far and I’ll be revenged! Those were Patty’s last thoughts before death descended upon her in the form of a knife straight through her heart. The masked woman, her right hand buried deep in Patty’s back, released the knife and stood up. She felt a vibration in her pocket. She reached in, pulled out her smartphone and declined Patty’s call. Samantha gazed down at the handle of the knife that stuck straight out of Patty’s lifeless body. If Sam felt any twinge of guilt or regret for her actions, she didn’t show it, for she embraced a new life, an exciting future with her secretary, a future unimpeded by Patty. Samantha then walked calmly out of the brownstone and headed back to the tower.